It’s not just a vacation, it’s a lifestyle. 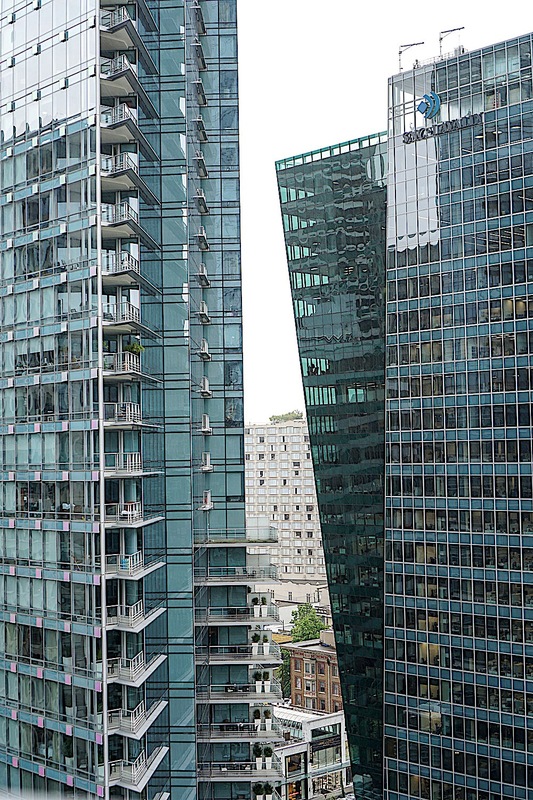 From the moment you set eyes on the twisting tower that makes its mark on the Vancouver skyline, you know that your stay at the Trump International Hotel & Tower Vancouver will be nothing short of five stars. 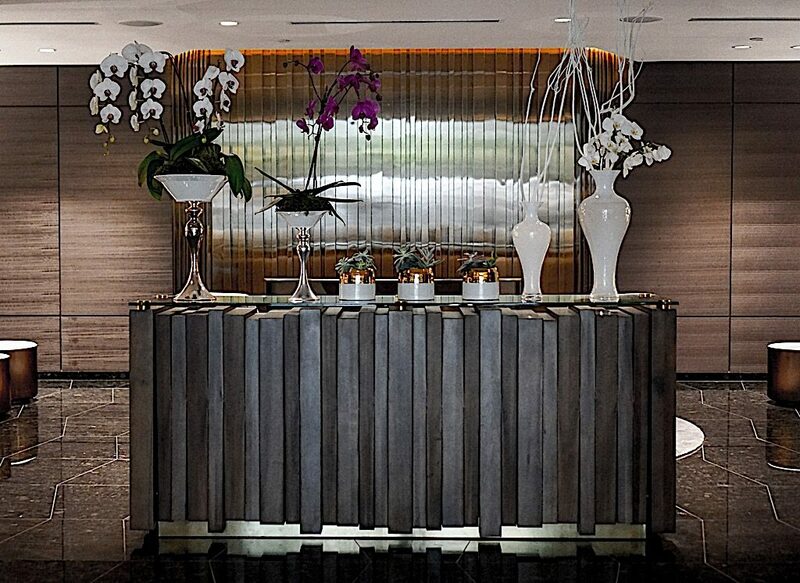 Greeted with friendly smiles from the impeccably dressed valets with white gloves, to the warm, lemon scented towels at check-in, any hectic emotions of travel you may have had on your way here completely dissipate as you know your vacation is about to begin at the Trump Vancouver. 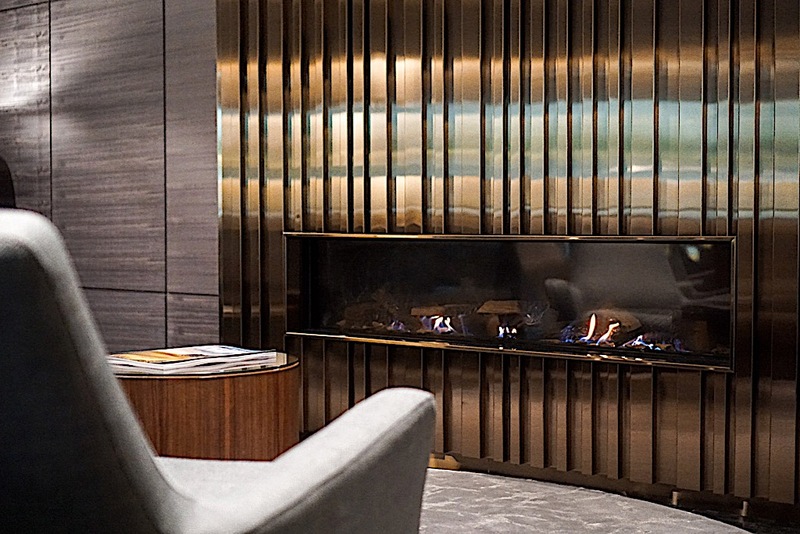 From the mirrored walls and the open lounge seating in the lobby, you can tell that this newly opened hotel was designed with their surroundings in mind. 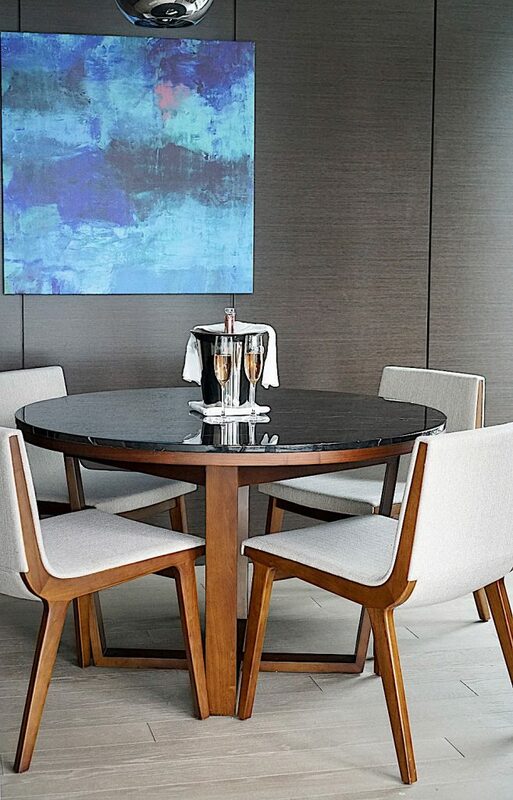 Consistent with the West coast vibe, dark organic wood panel the walls, natural colors of blue and green elements are scattered throughout the hotel in paintings, rugs and decor, and clean, minimal lines are evident in the furnishings. 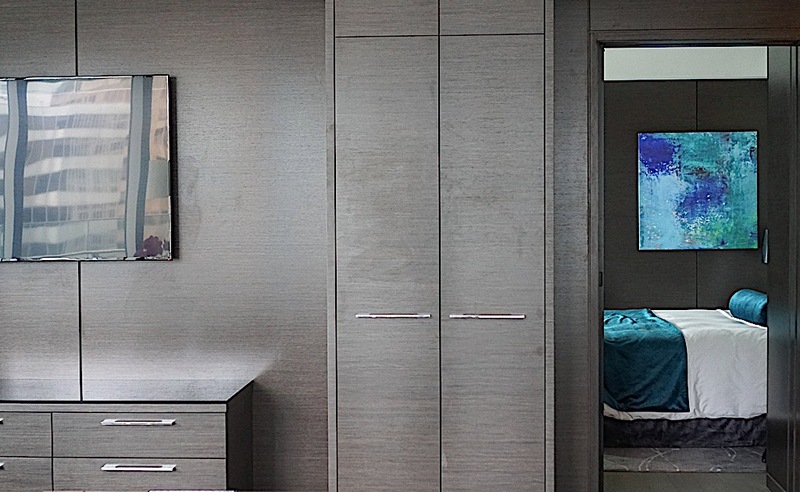 Every fixture, every mirror, every painting has been placed there with thought and intention proving that this hotel was built with no detail spared. 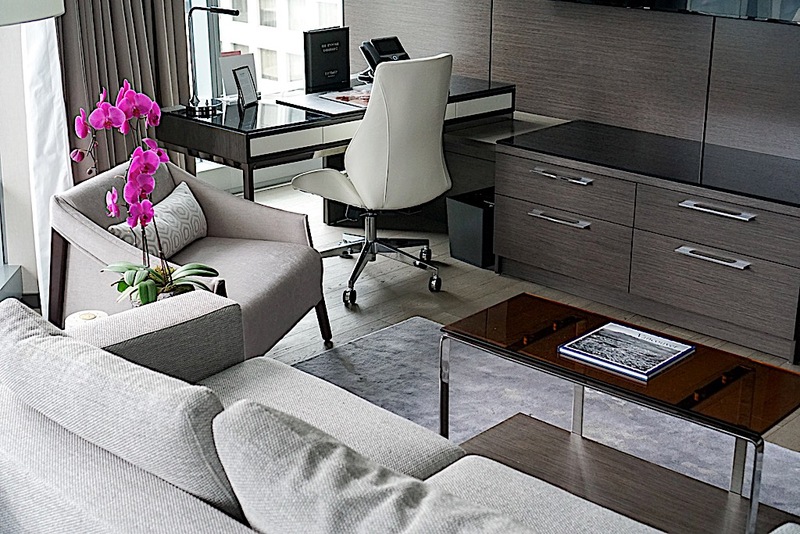 The Trump Vancouver features 147 generously refined and luxurious guest rooms that encompass aresidential feeling. 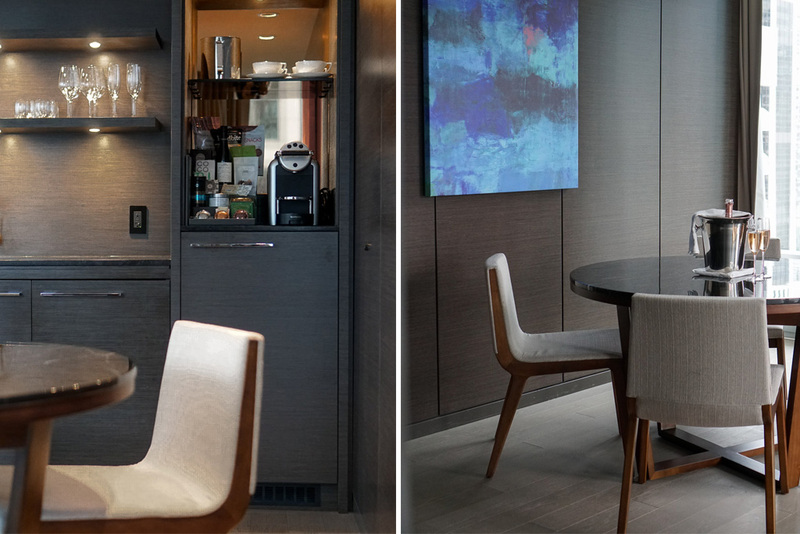 We stayed in a one bedroom suite on the 20th floor (there are 21 guest room floors in this hotel, the remaining 42 floors above are for residents) styled like a modern apartment. It boasts an open floor plan and was spacious for our family of five. Simultaneously inviting and modern, the exquisite decor and the well appointed living and dining space feel just like home. The entire room is bathed in natural light from the floor to ceiling windows that look out to a large balcony with spectacular views of downtown Vancouver. The city views are definitely worth the upgrade especially since we spent several nights on the large private terrace listening to the hustle and bustle of the nightlife below us while enjoying a glass of wine from the private bar. 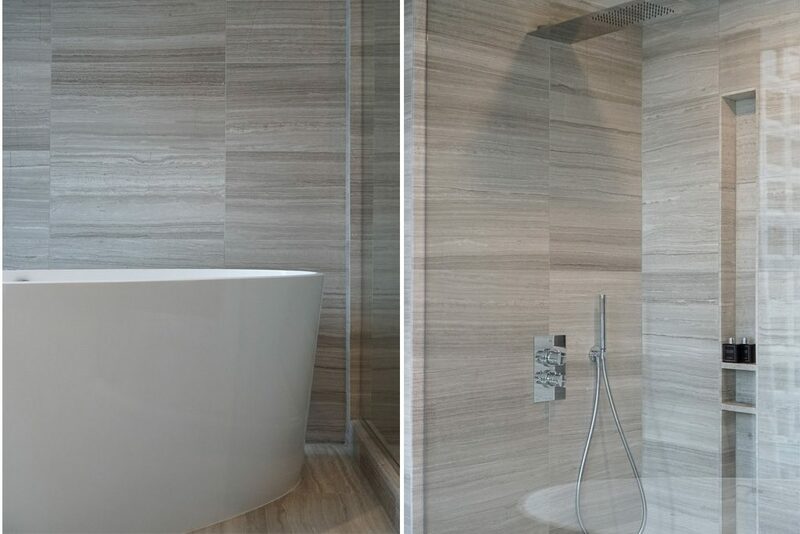 The rich wood paneling, oak hardwood floors, free standing tub, and heated marble bathroom, as well as the state-of-the-art technology in lighting, temperature, and window treatments are the epitome of fine living. With one king size bed, a queen sofa pull out, and an additional cot, there was plenty of space for everyone and every bed (including the cot surprisingly) was plush, yet firm, and ultra comfy. Needless to say, after we devoured the delicious truffles left by our bedsides at turn-down service, we all slept soundly every single night. For me nothing is more memorable than vacationing as a family. And while vacationing with kids could sometimes be challenging (let’s be honest here), this is a hotel where the adults AND the young guests are equally pampered. 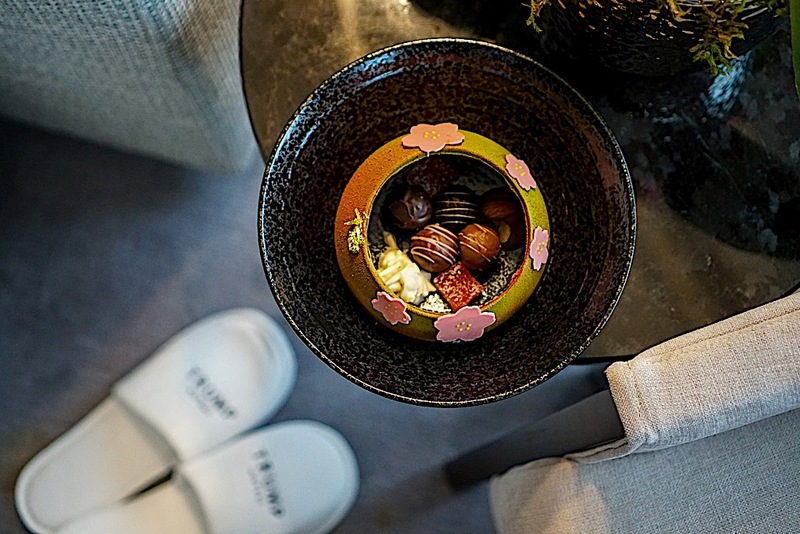 The kid-friendly welcome amenities such as coloring books, no-tear bath amenities, and child-sized Trump robe and slippers are just the beginning of how this hotel pampers it’s little guests. 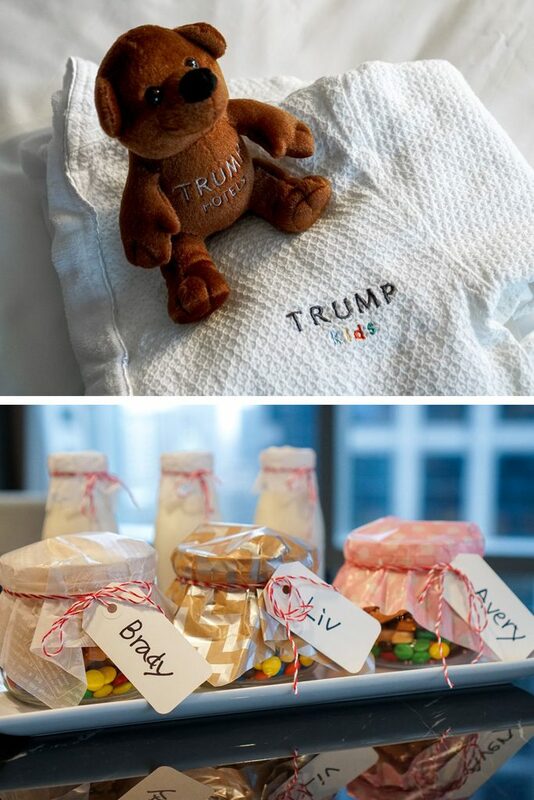 Upon arrival, the kids were welcomed with Trump Kids teddy bears and a chocolate basket filled with truffles and sugared fruit. On the second night of our stay, adorable milk jars and personalized jugs with cookies and M&Ms were delivered to our room. On the final night, the valet Su, surprised the kids with Trump Kids caps as a souvenir of our stay! In addition to all the goodies the kids received, we were surprised by the many kid-friendly dining options and fun kids cocktails which add to the enriching experience for our family. Without a doubt it is the little touches of the Trump Kids rituals that make family travel truly a vacation for the entire family. Let’s not forget our pets either! The Trump hotels are not only pet friendly but go the extra mile in welcoming our furry friends. Trump Pets is a unique program that provides your pet with their own plush bed, treats, and toys at no additional cost. Don’t want to lug all your workout gear while traveling, or just forget to bring them along? No problem! Travel Fit has a collaboration with Under Armour to provide you with shoes, clothes, weights, iPods, whatever you need delivered to your room for your workout needs. 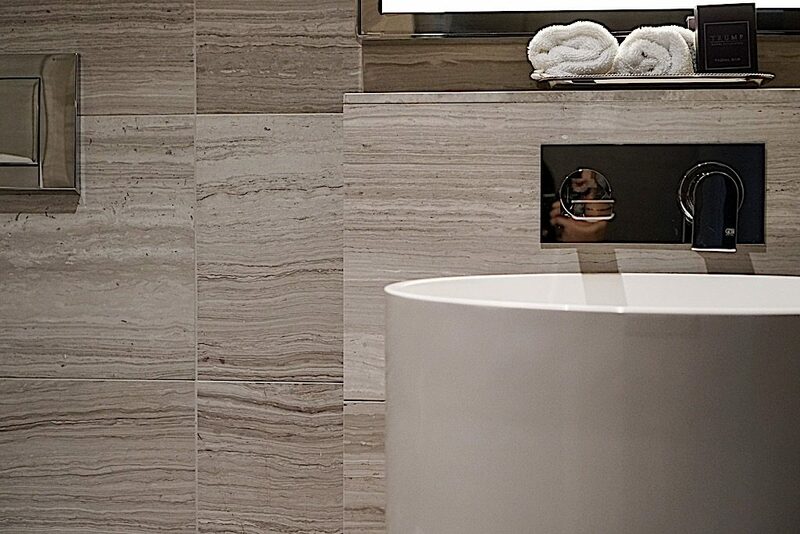 At no additional cost, this is all just apart of your experience here at the Trump Vancouver. Of course there is always the Fitness Centre downstairs too. 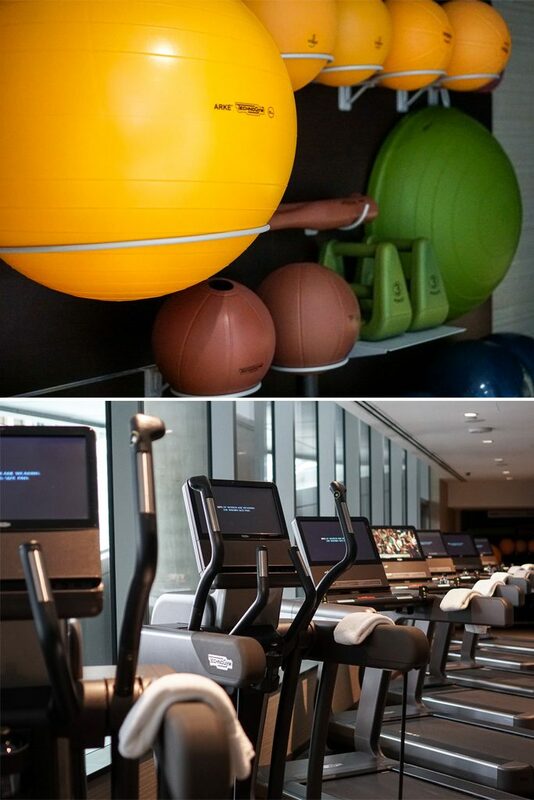 The Fitness Centre at the Trump Vancouver has all state of the art treadmills, elliptical machines, cross trainers and step machines by TechnoGym ARTIS. There is even a small, private yoga room where you can practice your poses or mediate away from the rest of the gym. A core corner offers balls in every color and size to help you stretch, balance and develop your core. The Trump also offers personal training sessions should you desire and can be arranged prior to or during your stay through the Trump Attache. The best way to relax after a workout, during a vacation, or just because is at The Spa by Ivanka Trump. It is a luxury escape to refocus and get pampered. I was able to experience an incredible treatment here and will cover my experience in a detailed blog post later. The pool at the Trump Vancouver is unique in that Monday through Thursday the pool serves as fun for the entire family. 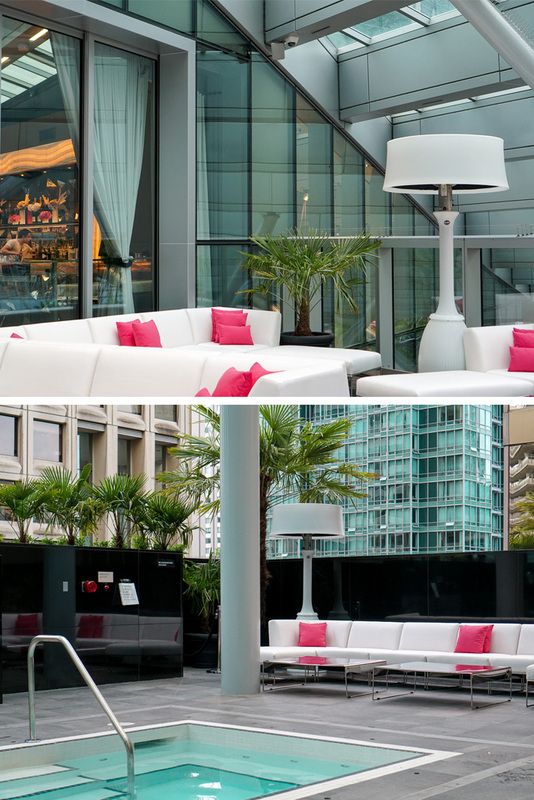 You can pop in for a swim in the indoor pool oasis or relax in the outdoor oversized jacuzzi overlooking downtown. 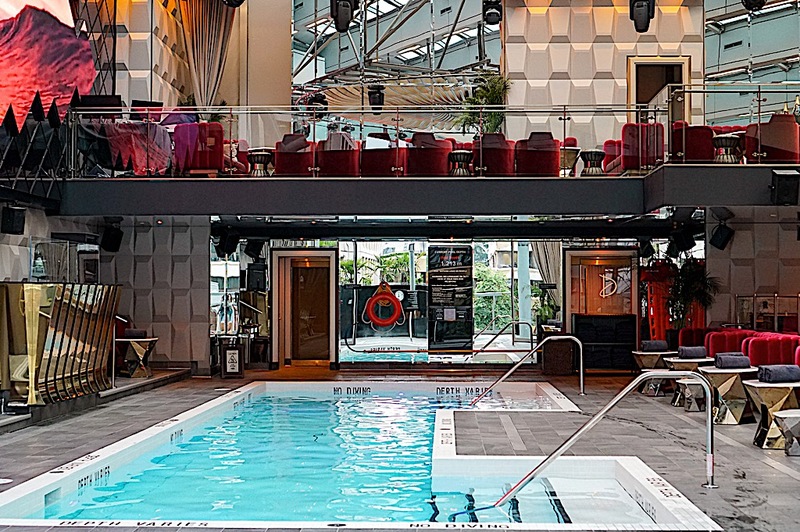 On the weekends (Thursday & Friday evenings and Saturday & Sunday) the pool transforms into Drai’s Vancouver, one of the hottest spots to grab drinks, people watch, and dance. 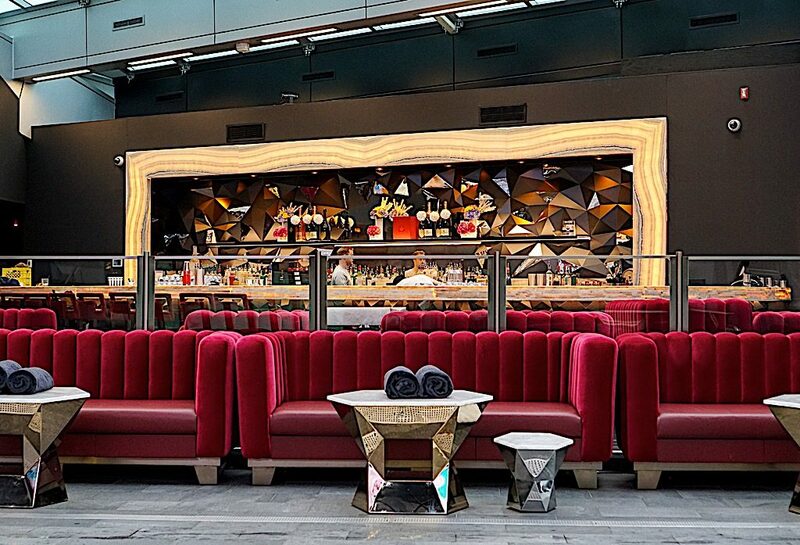 No need to head to Vegas anymore with Drai’s in town right here! 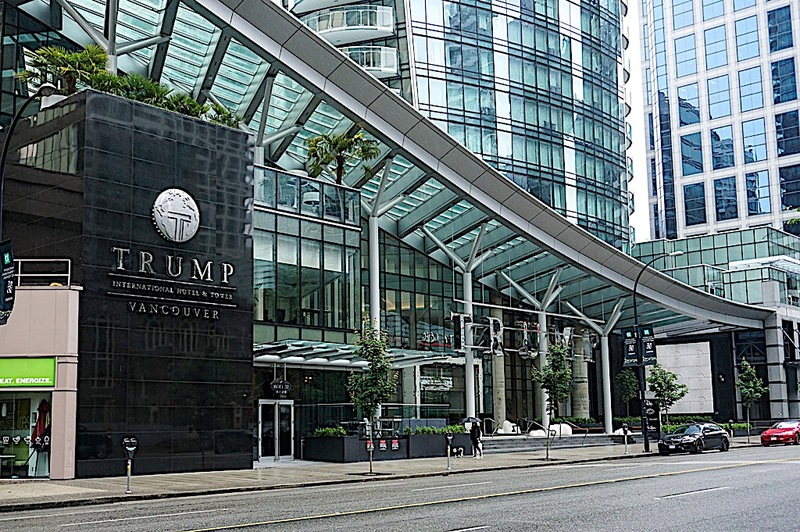 During our trip we did not rent a car since the Trump Vancouver is located at the heart of Golden Mile, close to many major tourist attractions, restaurants, and the famed shopping area of Robson Street. But when we needed to go a little further than walking distance, The Trump house cars were available to drive us within a few miles free of charge. Not every hotel house car can accommodate a family of five, but the Trump did not disappoint and had an Escalade ESV available to take our family around. And for a more luxurious ride (if the Escalade just doesn’t cut it), there is a Salamanca blue Rolls Royce to travel in style. And let me just tell you, it’s a showstopper. All eyes are on you (I mean the car) when you pull up in this beauty. At the Trump, it is all about the experience. It’s about being taken care of here at the Trump Vancouver. Whether it is Su at the valet who makes jokes with the kids or Doc, the house car driver who tells you stories about the city in which he was born and raised, or Benjamin at the Concierge who answers every question from my husband with a smile (and believer me there were a lot of questions), every single staff you meet not only remembers your name, but your childrens’ names, and more importantly makes it their mission to serve you. Whatever you don’t already have provided for you, you can request. Nothing is off limits and everything is within reach with the Trump Attache. Upon checking out of the Trump and ready to return our keys, I happened to catch the scribbled quote on the back of the hotel key card. It read, “Your time away is precious. NEVER SETTLE.” This could not be more true at Trump International Hotel & Tower Vancouver where you feel like a VIP. It’s about the lifestyle you worked hard for, the lifestyle you crave, the lifestyle you deserve. And while it is a luxury hotel, you feel at home here and the staff become your friends. It truly is inspired living. 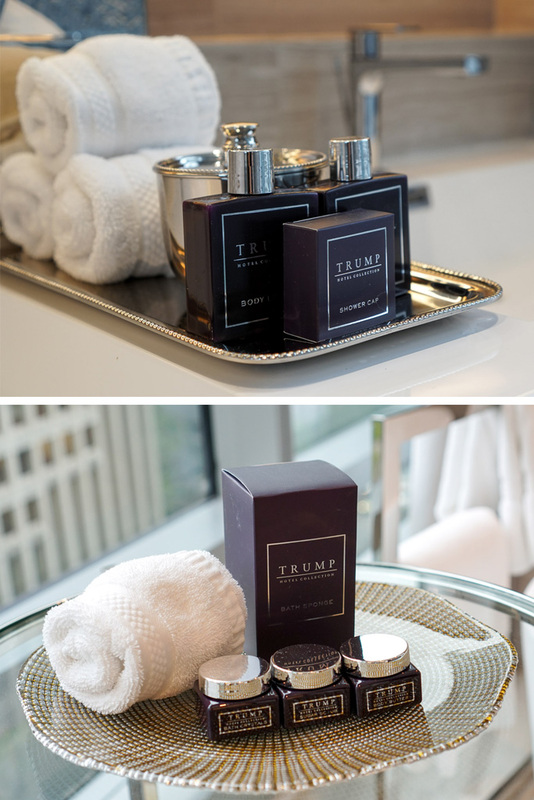 So don’t wait, book your luxury experience now and get pampered at The Trump Vancouver. 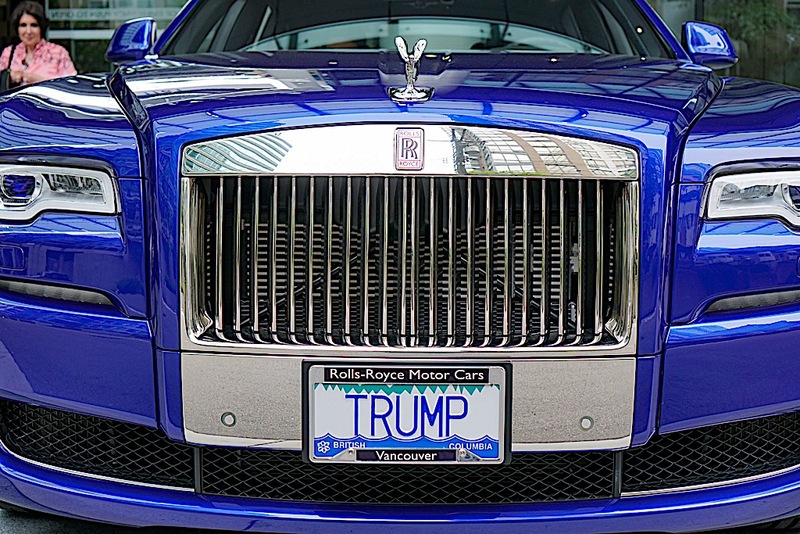 Thank you to the Trump Vancouver for sponsoring this post and your incredible hospitality and memorable five star experience. Hi Mariann! Yes, this hotel is five stars all the way. Everything you could want and more. Canadians are truly super nice and we loved it there. I want to go back and would also love to visit Montreal. It is amazing and so incredible Sirin! The bathroom is total goals! What an experience – everything Trump does is only first class. Totally amazing – must be on my bucket list to visit. Trump is all about luxury and the five star experience. When you move to CA, you should definitely look to doing a trip to Vancouver. It’s so close and such a beautiful city and you MUST stay here! Wow. All about the experience indeed! I love the quote about never settling and what you wrote about working so hard. It’s so true. We work so hard to be able to create these precious moments and adventures with our families and according to this The Trump Vancouver definitely makes sure a family has the ultimate experience and everything anyone could dream of in a vacation. I can’t stop thinking about the teddy bears and robes and those personalized jars of candy for the kids! Also the Under Armour Apparel ! I love every single one of these pictures and really appreciate the elegant details of the decor. The Rolls Royce is completely stunning! You looked simply gorgeous next to it and definitely made an outstanding presence! I really would like to stay at Trump Vancouver and I’m looking forward to hearing about the spa! Hi Jennifer! You totally nailed it on the head and it is about having the ultimate family experience and the fact that Trump Kids makes it so much fun and memorable for the little ones makes it stand out as a hotel brand. It was such an incredible stay and I know you would love it here too! 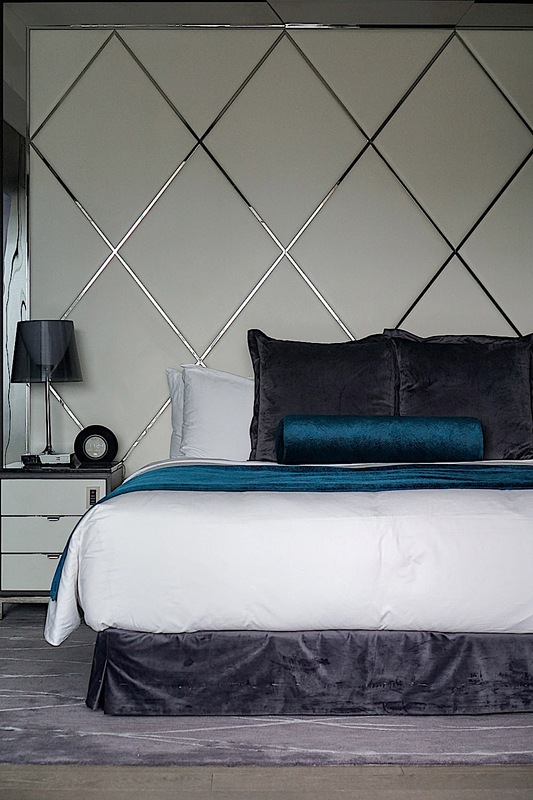 This looks like the ultimate luxury accommodation. 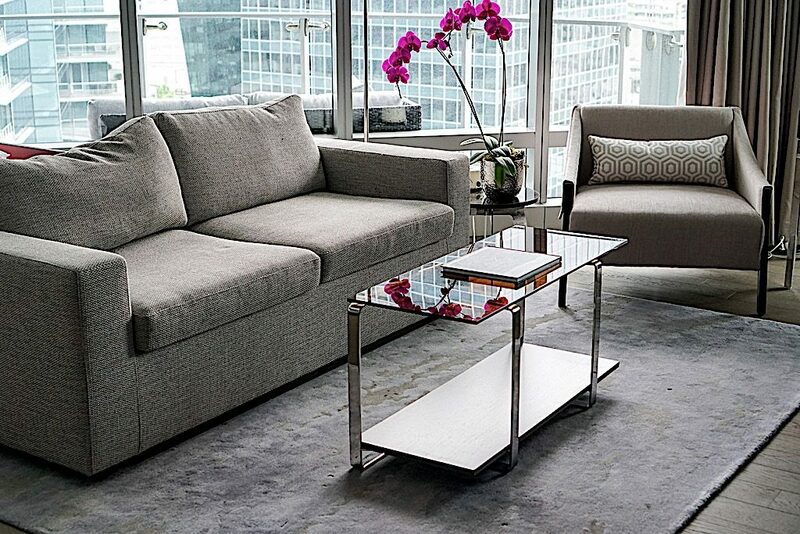 I love the modern minimalist interior! Thanks Jessica, you would love it here! Your girls would be spoiled rotten and wait till you see my post on their champagne tea experience! A must try! Thank you Aldora. It’s not just me though! The Trump is about luxury treatment and pampering for ALL of its guests. It’s about the experience and definitely a way to vacation in style. This all looks so luxurious!! 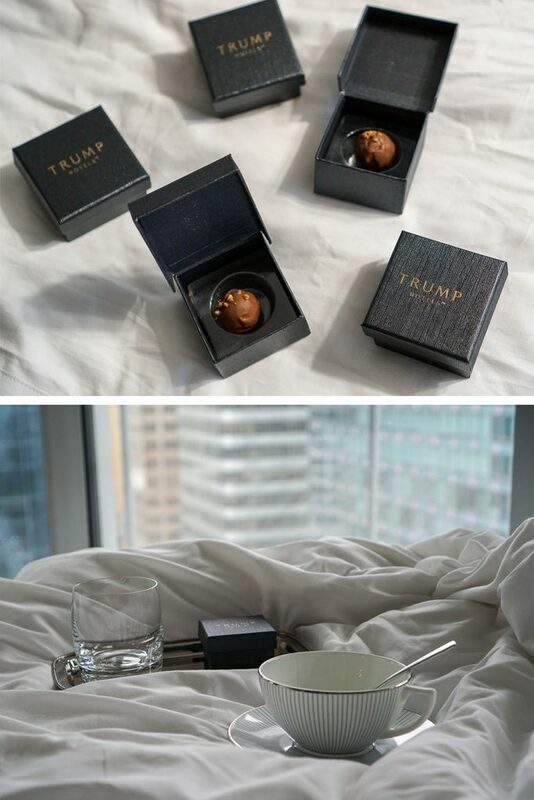 I have yet to stop by the Trump hotel here in Vancouver, but you are making me want to!! Yes you have to stop by if you are in the area! 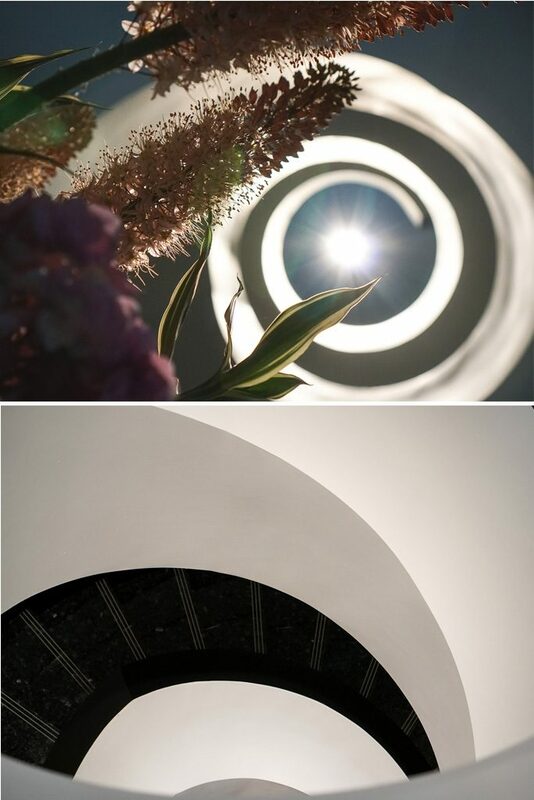 Even if you just pop in for dinner or the spa, it is a must-see and must experience hotel! I can’t believe you were a block away from my condo and I didn’t have a chance to met you in person. I walk by Trump everyday to go to my gym Equinox which is adjacent to Trump and and I see familiar faces in your pictures. I recently had dinner and checked the club with my girl friend after and I had great time. I’d love to check their rooms though, they look so luxurious and the bathtub looks like heaven. Is amazing that they are kids & pet friendly. I am glad you had a great time with your family and also loved Vancouver. I am actually thinking of booking a spa day for my birthday next week at the Trump. PS the company I work for supplied all the signage for the whole Trump building including the spa and I estimated the whole tender 🙂 I can’t wait for your spa review! You totally look like a boss lady in the picture. Simply Stunning ! This hotel is out of this world! The VIP experience is on a whole other level, so it seems like a great place to relax and let your hair down for a weekend! Thank you Jordan, it really is on another level but at the same time so attainable. Every guest is treated like a VIP and the hotel is so beautiful. It’s the perfect place to really relax and take a vacay. Wow this hotel is so cute, I have to stay there when I visit. You look amazing by the way. Not a big fan of the man itself but his hotels are for something out of this world! I love the details and how everything is so comfortable and elegant! Certainly looks like a VIP experience from the moment you arrive and you can’t beat those views! Also, that all black outfit si so chic and perfect for the occasion! You look so amazing! Glad you enjoyed. We all deserve to be treated like that from time to time! Hi Aimara, I totally understand what you are saying. Not everyone may agree with Donald Trump, but we can all agree that his hotels are amazing. 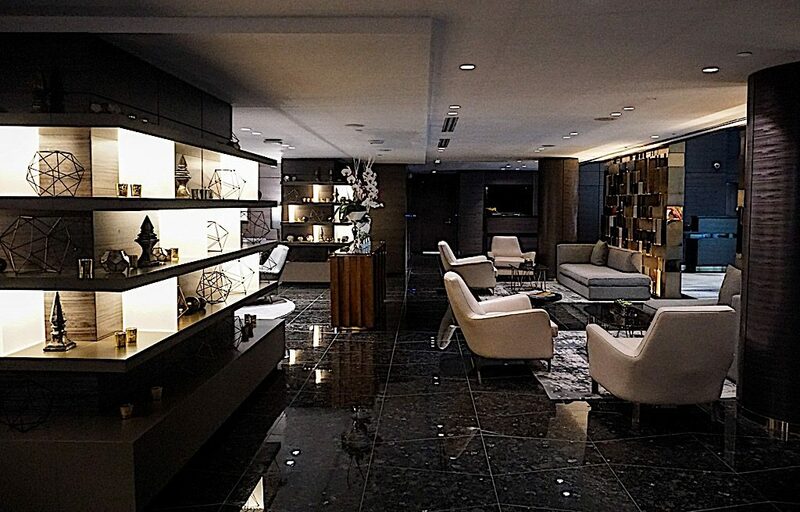 The level of detail and luxury that his properties represent are incredible and it’s hard to deny that this hotel is beautiful and also comfortable. It was such a treat to stay here and experience our vacation here and it is definitely something that everyone should try! This sounds like a hotel where truly everyone can be happy with their stay. I’ve heard that the Vancouver location is quite possibly the nicest of all the Trump hotels! I’m glad you had such a beautiful and memorable stay! It is so true, the kids had just as much fun as we did and it was nice that the hotel was located close to every major tourist attraction. The Vancouver property is truly a beautiful hotel and I fell in love with the furnishings as well. This hotel looks absolutely amazing! I love the room decoration and the view! Hope you enjoyed your stay! Thank you Violette. 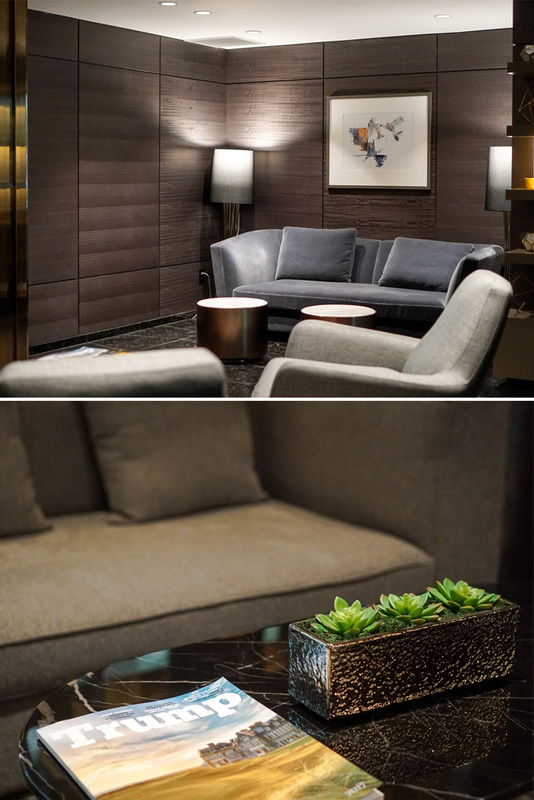 The Trump Vancouver IS amazing and the decor is just so modern yet comfortable. I definitely did enjoy my stay and can’t imagine staying anywhere else when I return to visit. 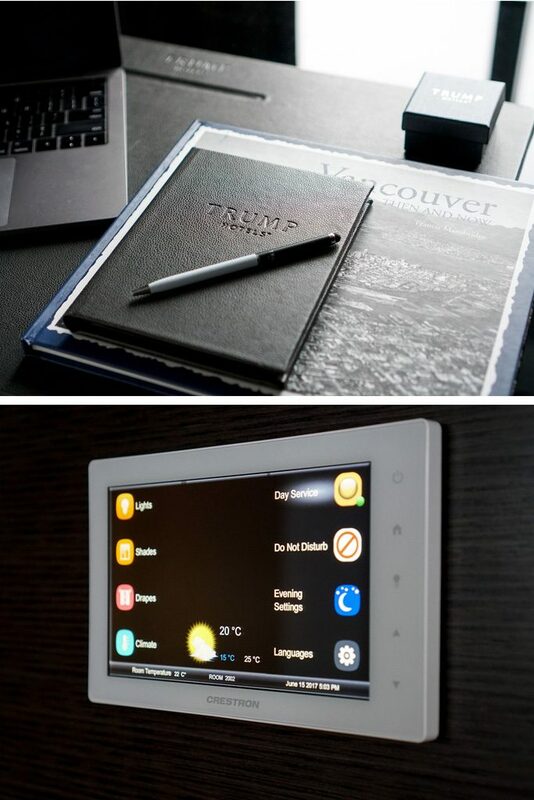 The Trump Vancouver is really a dream. Wow, so beautiful. A place I’d definitely want to visit.Your outfit’s the bomb too. Loving this post. Hi Sophie! Thank you, the Trump Vancouver is really a beautiful and welcoming hotel. You would love it here and in Vancouver if you have a chance to visit. Aw, I didn’t realize the Trump Vancouver was so kid friendly! I’m sure the kids were really excited with all the cute gifts, and also fun for you with the beautiful room and amazing services! Yes, it totally is! The Trump Kids amenities really add that special touch to the whole vacation and the kids appreciate being recognized too. The service and attention at the hotel is really personal and I loved staying here. Our family is doing a cruise with an end point in Vancouver. We’re planning on spending a few days there afterwards. This just sealed the deal for our hotel selection. Love the photos and review. Was the house car service fairly available or is it tough to get? Also, did you like the location of the hotel? It seems central to everything but would like to make sure. Thank you! How stunning in this hotel! I totally love everything about it. I haven’t been to Vancouver yet, but when I do, I’ll be sure to check out the Trump. Oh yes Jasmine, Vancouver is such a fun city and I loved it there. I plan on going back again soon. And I will definitely be at the Trump if I do. 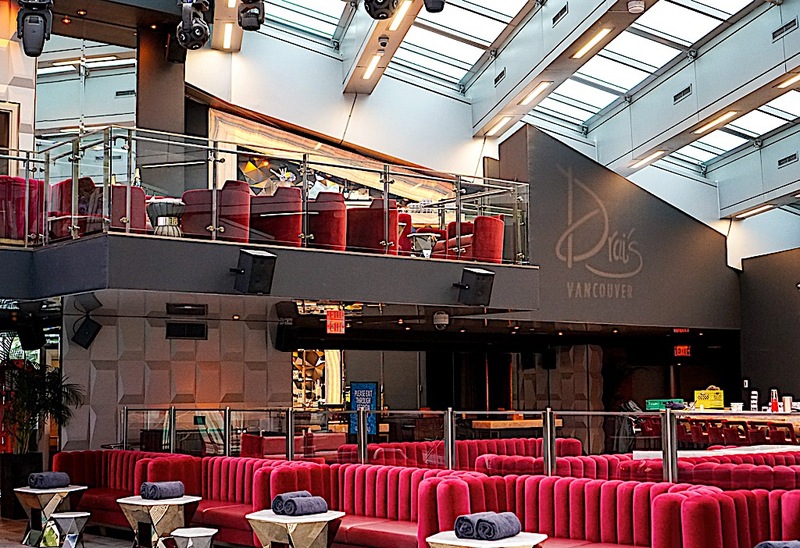 You really need to check it out for yourself and visit Vancouver too! They really do such a great job with all their hotels. I’ll give them that. They never miss out on all the details. I have yet to go to Vancouver but I’m dying to go. Seriously such a stunning hotel. And that Rolls Royce experience is the cherry on top! Thanks Jenn. The decor is beautiful isn’t it? The kiddos loved all the little goodies they got and felt so at home here. Wow The Trump Vancouver looks divine! We just stayed at The Trump in Waikiki and we LOVED it. The service and amenities are like no other! You did a post on Waikiki and we decided to stay there this trip. Vancouver looks amazing!!!! Next time we go there, we forsure are booking The Trump hotel! They definitely go above and beyond and the hotel looks so gorgeous! Thanks for sharing!!! I am so glad you enjoyed the Trump Waikiki and now you are familiar with the level of service and luxury of the Trump hotels. 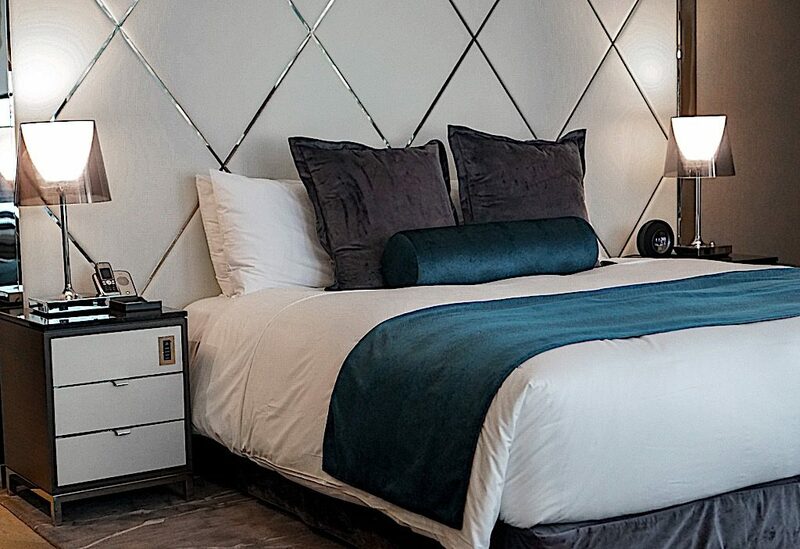 Not only would you love Vancouver, the Trump Vancouver is definitely where you would want to stay. It truly is a spectacular hotel that will exceed every expectation! Thanks Sharon. The Trump hotels are beautiful and this being one of the newer ones, it is so incredible and the decor is amazing. The experience you get here is definitely one you won’t forget and I highly recommend you check this hotel out! From the lobby alone, I knew I would love the entire feel of Trump Vancouver. 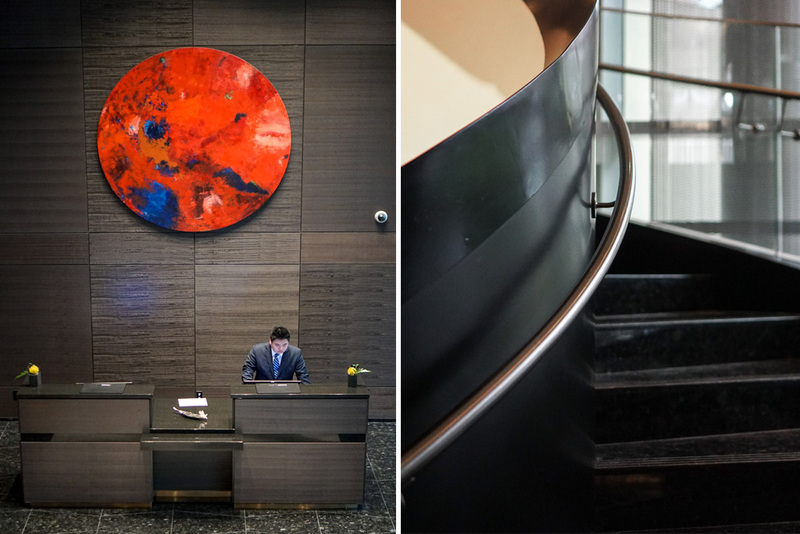 How incredible is the spiral staircase and art behind he checkin desk? It’s good to know it accommodates a family nicely and the view sounds exquisite too! There’t nothing like enjoying a glass of wine in the evening with your husband after the little ones are asleep! What really had me was the personilation and the length they went to see that your little ones had a good experience as well. That alone makes me want to book my next stay at a Trump hotel! “Commanding presence (the car, not me)” I’m just sitting here thinking how YOU make the car look even more glamorous! 🙂 I love that saying too! Our time away is SO precious! Why settle for less than amazing if we don’t have to?! You’ve really enticed me for a stay with my family! Hi Manda. You are right on when you say that they go the extra mile to make sure the kids feel welcome and enjoy the experience. You and your family would have the most memorable experience here at the Trump Vancouver and must look into booking a vacation there soon! 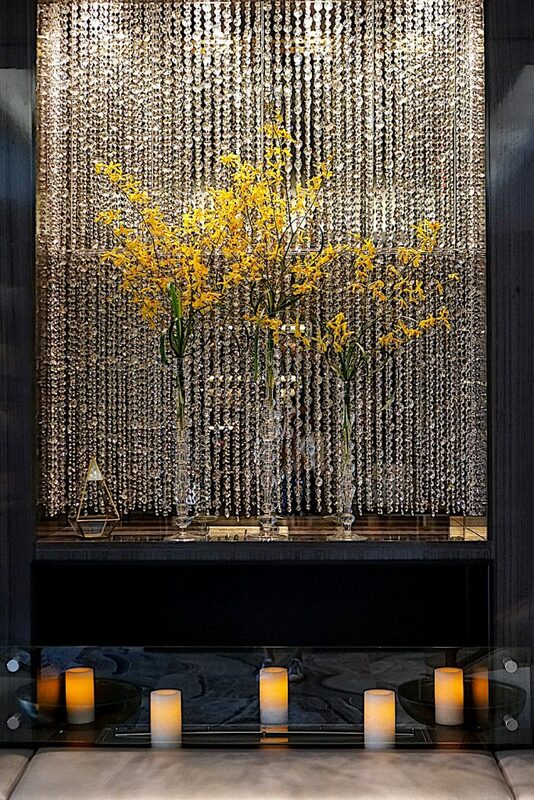 Ohhh I am obsessed with Hotels as you know and Trump Vancouver is definitely on my List. You definitely know the luxury and experience you get at the Trump Hotels and if you have to come to Vancouver and stay here. 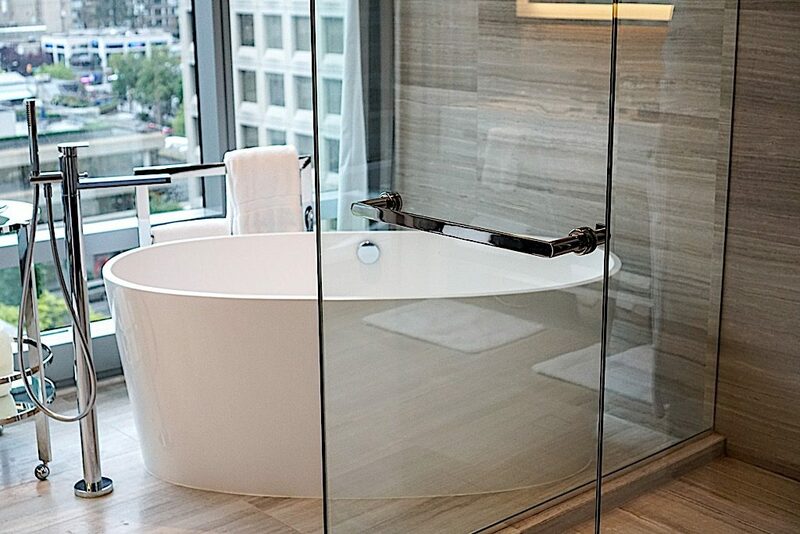 The tub is gorgeous and the views of the city are equally amazing. If I had a stay at Trump Vancouver like yours I’d definitely having “Never leaving, never settling.” as a motto too. The experience seems to be a VIP one from the very first start to the end. I especially appreciate the fact that they have everything you would need for a gym experience. I often stay at nice hotels, but have forgotten (or by purpose haven’t taken with me) my gear and when I’m at the hotel I actually do want to work out, but have nothing to work out in. I also love the beautiful bathroom with the beautiful tub with views to die for and for you as a family it must have been a great experience for all of you! Absolutely a masterpiece of a review as well! Everyone is treated like a VIP here and yes, that whole Trump Fit program is amazing. I’ve been staying at the Trump Waikiki for years and didn’t even know they offered this program so it is definitely an added bonus for vacationers. I know you are used to staying at beautiful hotels and this one will exceed your expectations Thomas! Aww, that sounds like a perfect life! The hotel looks so luxurious and chic, love everything about it. I would definitely like to spend some time there and enjoy Vancouver. The rooms are so stylish and I love the minimalistic business vibes of them. Everything that you’re going to need is there. And that’s great to know that kids there are also welcome 🙂 How cute all these things look! 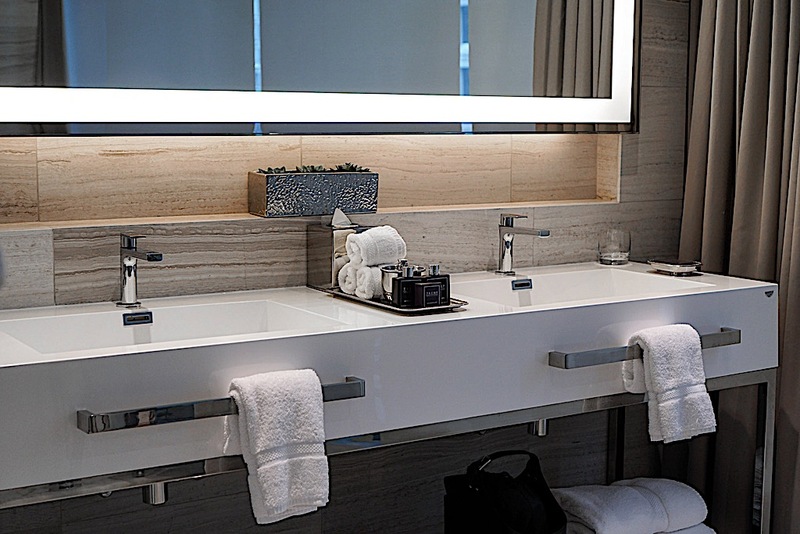 It does feel like everything is perfect when you are staying at the Trump Vancouver. Even though it is a luxury hotel you still feel so comfortable even with children. Vancouver is such a beautiful city and you should visit if you haven’t already and stay here! Such a classy hotel! I am a sucker for a big bath tub, and with that view I could soak for hours! Omg I can’t have enough words to tell how beautiful to read and heard more about your experience. The warm welcome and the sweeties for the kids for example … everything is perfect. Love the bathroom with skincare products and how about furniture . Always on the top everything. I hope one day I can live this extraordinary experience. looks pretty! hope you are having fun in Vancouver!! This hotel looks and sounds incredible. It totally seems like a 5 star experience. They seemed to have thought of absolutely everything. I’m envious that you’ve gone to Vancouver. I have so many friends I met in Toronto who went back there that I want to visit and I’ve only been told how beautiful the city is! It sounds like you had an incredible stay and vacation. I’ll have to check it out when we fly there! Trump International Hotel in Vancouver looks amazing! You are so right, it’s not a hotel, it’s a lifestyle! This hotel literally has everything to cater for guests from all kinds of age groups. I’m stopped by Vancouver next year for Whistler to ski, I will have to book myself with trump Hotel for a night or two! Thanks for the great recommendation! I love how you said it’s a lifestyle. It truly is! The hotel is stunning and looks like an incredible place to stay. Everything in the hotel just looks so incredible. Wow. A must visit!